Viewers of the the PBS genealogy series “Finding Your Roots,” hosted by American historian Henry Louis Gates, recently got a taste of early Illinois history in the Episode 6 of the series, “Black Like Me,” which first aired in Nov. 2017, then was re-aired this month on WTVP in central Illinois on Tuesday, Jan. 16, and Sunday, Jan. 21. Episode 6 featured the genealogies of Bryant Gumbel, Tonya Lewis-Lee, and Suzanne Malveaux. Malveaux, a television news journalist, belongs to a family from New Orleans, La., who are of African-American and French descent. As “Finding Your Roots” showed, genealogical researchers have traced the Malveaux line back to a marriage with a woman of a Louisiana French family named Rochon, whose lineage derives from Pierre Rochon, born 4 Oct. 1717 in Mobile, in the French colony of Louisiana (today Alabama). Pierre was one of the children of Charles Rochon (or Rocheron), baptized on 5 July 1673 in Quebec City, New France (Canada), one of the founding settlers of Mobile who had previously worked as a fur trader in the Illinois Country. Charles’ wife was Henrietta Colon (Henrica), who was born 27 Nov. 1698 in the Grand Village of the Illinois near present-day Utica, Ill. Henrica’s parents were French colonist Jean La Violette Colon and Catherine Exipakinoa (or Ekipakinoa) born circa 1674 and died circa 1707, a woman of the Kaskaskia, one of the most prominent and numerous tribes of the Illiniwek. Suzanne Malveaux’s Native American ancestress Catherine Exipakinoa was one of the many members of the Illiniwek who converted to Christianity and were baptized as Catholics at the Mission of the Immaculate Conception of the Blessed Virgin, which had been established in 1675 through the missionary activities of Father Jacques Marquette who died that year. “Catherine” was the Christian name Exipakinoa was given at her baptism. 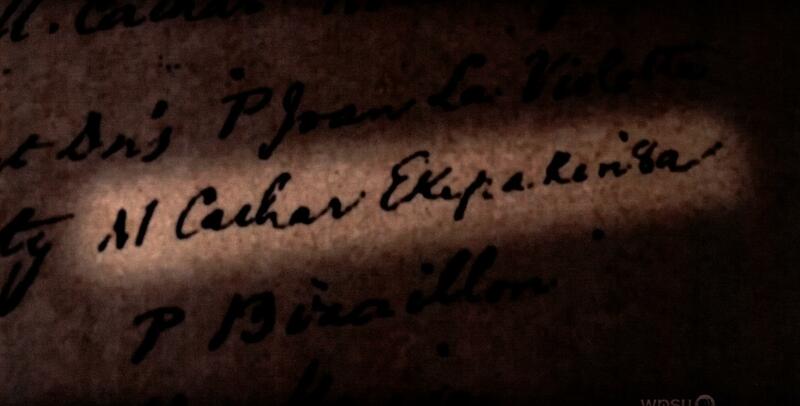 This image from Episode 6 of “Finding Your Roots” highlights the name of Suzanne Malveaux’s Native America ancestress Catherine Exipakinoa on the page of the 1698 baptismal record of Catherine’s daughter Henrica. Catherine was a woman of the Kaskaskia tribe of the Illiniwek who converted to Christianity and was baptized at the Catholic mission at the Grand Village of the Illinois near Utica, Ill.